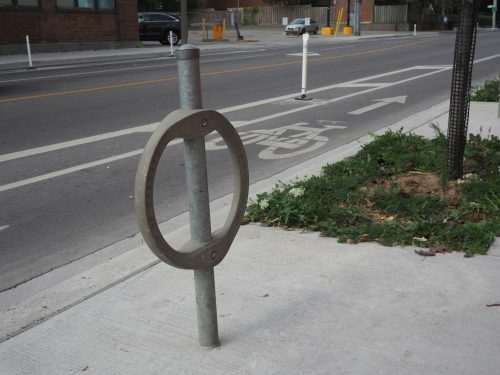 Toronto’s bike ring has an iconic presence on the City’s streets and a history that dates back to the 1980s. Prior to the bike ring, the City’s coin-operated parking meters became the unofficial on-street bicycle parking facilities. During this time, discussions to potentially add a ring around parking meters to accommodate bicycles took place, but didn’t move forward. This resulted in the need to accommodate bicycle parking in a different, stand-alone way.